There are two types of golf cart engines: gasoline-powered and battery-operated. Those trying to purchase a new golf cart should first decide the type of golf cart engine that he would like to have in the new vehicle. Several manufactures of golf carts have of late shifted away from equipping golf carts with gasoline engines to power their vehicles exclusively for golfing. Although many producers of golf carts no longer use gasoline engines for golf carts, they extensively use these types of engines in other types of vehicles such as those connected with ‘off-road’ driving or driving by limited group of people. There have been significant technological developments in gasoline-powered engines. Many producers, still making use of gasoline engines exclusively for golf carts adopt this latest technology. These engines emit minimal amounts of harmful gases, do not pollute the atmosphere and do not make any noise, while running. In addition, the latest versions of gasoline engines are more powerful than the battery-operated engines. The following paragraphs explain the merits and demerits of each type of engine fitted in golf carts so that one can opt for the correct type of golf cart that meets his needs. It is important to know the type of engine that a cart should have, especially if the golf course is rocky or a hilly area. The later version of gasoline-driven golf cart engine is, normally, more fuel efficient and will give enhanced gas mileage than earlier models. However, the drawback in the gasoline engine is the heavy burden of maintenance expenses. The maintenance jobs for this type of engine are usually carried out by experienced mechanics, unless the golf cart owner is confident of undertaking maintenance without any external help. The high costs of mechanical parts and labor account for the huge maintenance expenditure on gasoline motors. In contrast, maintenance costs of battery-powered motors are relatively lower and that is why this type of motor is more popular these days than the gasoline-powered engine. Many new developments in battery technology have made battery-powered engines more powerful as compared to the models of previous years. 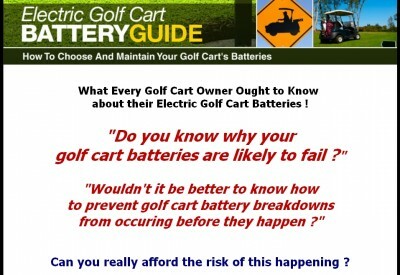 Purchasers of battery-driven golf carts can get these days an extensive choice of models with different battery patterns; some of them are nearly heavy duty types. The latest versions of battery-powered motors have longer running time without recharging and even if they are to be recharged, it is now much simpler, quicker and more secure than in the past. As there are large number of models in battery-powered golf cart engine segment, purchasers of golf carts now have a wide choice of prices that suits everyone’s budget than one can get in gasoline-powered vehicles. 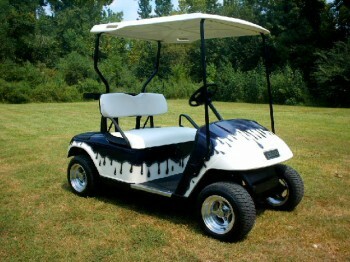 The type of terrain on which the golf cart will be used determines the type of golf cart one should buy. A golf cart powered by gasoline engine is ideal if one proposes to use the vehicle on a difficult hilly terrain as gasoline models can exert more power for driving up the hill. On the other hand, a battery-powered golf cart is more appropriate for driving on a comparatively flat terrain and price-wise, it is much cheaper than a gasoline-powered vehicle. Whatever be the type of motor, the quality has improved substantially in the recent models.